Most of our Hematite rings are engraved with a soldiers head on them. Hematite is a stone that is thought to strengthen the heart and give you more courage. They used to give soldiers a hematite stone or a ring set with a hematite stone to help them when going into battle. This ring is usually plain but does sometimes come with a pattern engraved into it. The signet rings can come in all different shapes, square, round, oval, heart shape and even a hexagon shape. The top of the ring is ideal if you wanted to maybe engrave an initial into it. These rings make ideal gifts. You are most likely to see these rings with the words Dad, Mum, Nan, or Sister. The rings can come just plain yellow gold or they even come with clear cz stones set into the word and in rare circumstances they can even be set with diamond stones. Onyx rings are very similar to the plain signet rings. They come in various different shapes, round, oval, square or even hexagon shape. Instead of the top of the ring being plain gold, there is a Black Onyx stone set into it. These stones come with a lovely smooth finish. They are ideal for male or female wanting to wear something simple. These rings look very attractive. They are mainly worn by males but they do make smaller versions for women. You can clearly see by the image why they call it a puzzle ring. The ring looks like a puzzle, and even all of the pieces come apart so that you can solve the puzzle by putting it back together. They come in 4 pieces, 6 pieces or 8 piece puzzles. A Claddagh ring usually come in plain gold but, can also come with stones set into the front of it. The Claddagh ring is a traditional Irish ring given as a token of love or worn as a wedding ring. The design and customs associated with it originated in the Irish fishing village of Claddagh, located just outside the city of Galway. The Claddagh's distinctive design features two hands clasping a heart, and usually surmounted by a crown. The elements of this symbol are often said to correspond to the qualities of love (the heart), friendship (the hands), and loyalty (the crown). These rings make an ideal gift for that special love in your life. These rings come in various different sizes, making it an ideal ring for either male or female. The rings get there name from the way it looks. If you look on the top of the ring there is a buckle image. These buckle images can come as either a single buckle (see picture) or can come with the image or 2 buckles which we call a double buckle ring. There is usually a lovely detailed pattern set onto this ring. These rings are mostly popular with the men. These rings come in a number of different sizes but they are usually fairly bulky looking and this is why it is not a popular ring with women. The ring is called a saddle because of the way it looks. As you can see by the picture there is a riding saddle which is very well detailed with rope and stirrups. The ring can come just plain gold or can come with clear cz stones set into the top of it. A keeper ring is said to be a ring which is a ring worn to stop another more valuable ring from slipping off the finger. These rings come with rows of small gold balls. You can get 1 row of balls all the way up to 6 rows of gold balls. These rings can be worn by both male or female and are an ideal ring if you just want something plain and simple, or you can wear it the traditional way by keeping another ring safe. These rings are mainly for women but I have seen cameo rings for men in the past but they are fairly rare. These rings normally feature Victorian women's profiles but the rarer cameo rings feature men of power such as kings, nobles and religious figures. 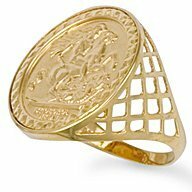 The rings are usually set upon 9ct yellow gold but can be set upon 14 or 18ct gold. They are a lovely looking ring. Here at Pledge we have thousands of rings available for sale. This small selection above are the most common styles of ring that you are most likely to see available for sale in our stores.